Can you help Peter find the perfect place to pray? Peter is used to seeing his mom pray in her special prayer room, and now you can help him search for his own place to pray—Peter's perfect prayer place. Is it under his bed? Up in his treehouse? Between the pots and pans? Where can God hear him best? There's lots of fun as Peter looks and looks, but in the end, he learns that although it's great to have a special place to be alone with God and pray, God hears you no matter where you are—under, up, or in between! 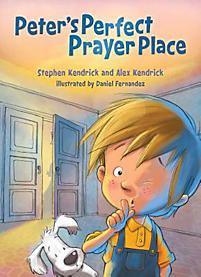 This companion book to the movie War Room will teach young readers an important lesson about talking to God. And the fold-out prayer chart and stickers in the back of the book will let them track their prayers as well as God's answers! Recommended for children age 4 to 8.